The Mac Factor Blog: Getting Rid Of Your FSP? Why? Getting Rid Of Your FSP? Why? Lewis (co-owner of strongsidetactical) posted an interesting question on the Strongside Tactical Facebook page last week. I completely agreed with his point and had not really thought to do a blog post about it. Until now. The question revolved around front sights and optics. All the time, you see people who buy or build AR15s and the first thing they do (sometimes before even shooting the gun!!!) is rip off the standard Front Sight Post and replace it with a pricey folding front sight! Horrors! It's time to address this properly! More after the jump! The standard A2 front sight post has been on the AR15 platform since Stoner designed it 60 years ago. It's sturdy, reliable, functional (as the gas block), and basically free (as part of the gun when you buy it). Adjustment is simple if you understand the concept. The sight post on the FSP only adjusts your point of impact up or down by rotating the post clockwise or counter-clockwise. Once you are set, you basically never have to touch it again. Adjustment is easy either by using the tip of a 5.56 round (useful in the field) or one of the special sight adjustment tools which are sold today. These same concepts would be true for any folding replacement front sight you may add to your rifle. Up and down adjustment will work the same way. After you have a solid, reliable low-profile gas block, then you are free to find the extended length rail of your choice and then add a folding front sight to the top of the rail. Looks a little different, works the same, cost is pretty significant (think at least $300-400 for a new rail, gas block, front sight, and possible gunsmith costs). Of course, this is all for naught now because many companies are offering extended length rails which have front sight post cutouts for the standard FSP, allowing plenty of rail space in front of the sight for lights, sling mounts, etc. See the pics above and below of my rifle, which has a Daniel Defense Omega X 12.0 FSP rail. I really like this rail and the whole concept behind FSP cutout rails. In my opinion, this is the way to go for people who demand extended rails on AR15s. 2: THE MYTH THAT THE FSP OBSCURES THE VIEW THROUGH AN OPTIC: The Front Sight Post will sit in front of your optic at a height of about 2.75 inches above the bore. Most red dot optics aim to maintain a lower 1/3 co-witness, so when the user looks through the optic, the front sight post will be visible in the lower 1/3 of the optic glass. Now here's the misconception. Our brains are smart (literally). 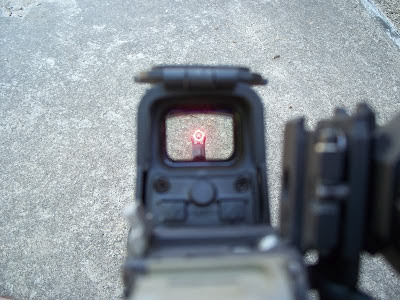 If you look through your Aimpoint or Eotech and focus your eyes on the front sight post, you will see it very clearly. THIS IS NOT WHAT HAPPENS WHEN YOU ARE SHOOTING. Fortunately, we can only focus our eyes on one thing at a time. 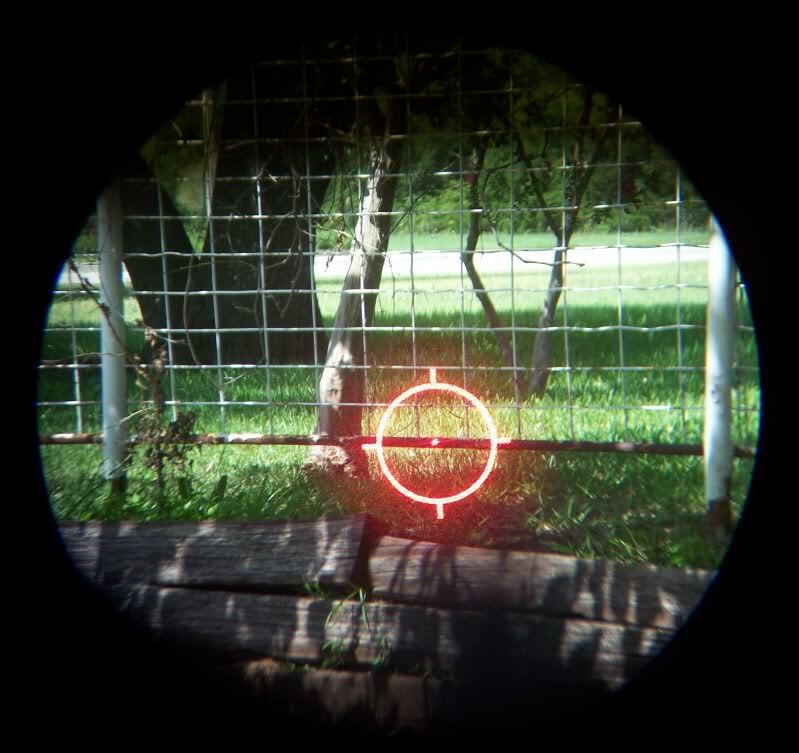 When aiming down sights through a red dot optic and looking at your target, our brain ignores the front sight post, making it very blurry and not recognized at all. Shooting with both eyes open helps with this as well. The FSP being there does nothing to obscure the view through the optic or make getting on target with the red dot difficult. Here are a couple of pictures I could find illustrating this point. Eyes focused on Front Sight makes it visible. Eyes focused on target, FSP blurry in lower right corner of view. No Obstruction. View through a magnified scope; the FSP is invisible in the view. Hopefully, these pictures illustrate the point that the FSP obstructing the view through an optic is a MYTH and not a REALITY. If this is new to you, I strongly encourage you to pick up a rifle with a standard FSP and an optic and look through it, even shoot it if possible, just to experience what I'm talking about here. So, in conclusion, put the brakes on those plans to shell out money on fancy folding sights for your AR15. Consider all the options since the configurations of rail systems for AR15's now can pretty much meet any need or desire. I'm a huge proponent of retaining the standard AR15 FSP and configuring the rifle around that. I feel it's "Essential" to my rifle, especially since it came that way from the factory. Hopefully this post has cleared up some confusion about optics and front sights and you have a little more to think about when building your AR15. This article is very helpful for me and I know many things. Air rifles lover who wants to buy best air rifle this article helps him very much.